In 1990, I built a narrow gauge model railway based on a prototype located in the grounds of a country manor. I needed a name for the manor and layout and the name Belfield Hall Estate Railway was chosen, based on our street name. The layout was exhibited around the South East (and North Wales) for some 10 years and so I became quite attached to the name. Many shows present exhibitors with a badge to remember the event by. 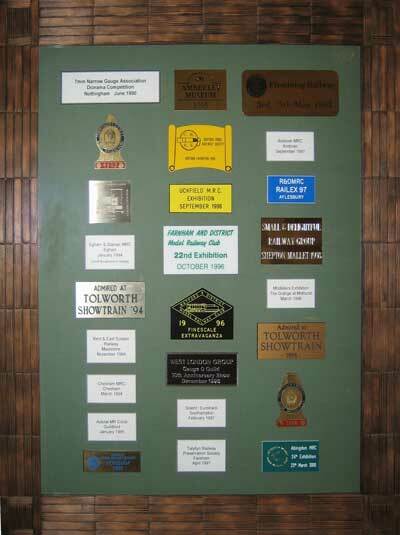 Most layouts become adorned with their badges, but the BHER had nowhere to display them. When the layout was finally retired, this picture was constructed to record its visits. There is no connection to a real Belfield Hall which existed near Rochdale.